Members receive special monthly discounts at partner businesses supporting the Museum. 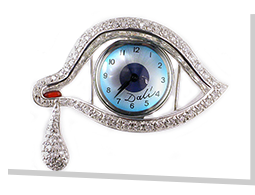 During the month of November, Dali Museum members receive a 10% discount on any one product purchased at vomFASS St. Petersburg. Discount may be used daily during the month of November. Please present your Museum membership card at checkout to receive the discount. VomFASS St Petersburg, located at the corner of 1st Street and 3rd Avenue NE in downtown St Petersburg, is a retailer of artisan oils, vinegars, spirits, liqueurs and wines from around the globe. The store has a unique taste-before-you-buy concept. You can taste anything, from bourbon to pink grapefruit liqueur to pistachio oil or date vinegar, just to name a few products. VomFASS also has public and private events, including but not limited to wine, scotch and cocktail tastings. Visit vomFASS to enjoy a distinctive experience.